The Big Blue Box Volunteer Challenge is a unique fundraising cycle that took place June 5th- through 19th. The challenge passed through 35 towns along the Wild Atlantic Way route in Ireland. Starting in Moville, Co. Donegal travelling the west coast of Ireland to the south reaching Kinsale in Co. Cork. Local representatives cycled from town to town with a Big Blue Box. When they reached each town or village, the local people of the particular community had the chance to place a symbolic item inside the box for the next town or village on route. 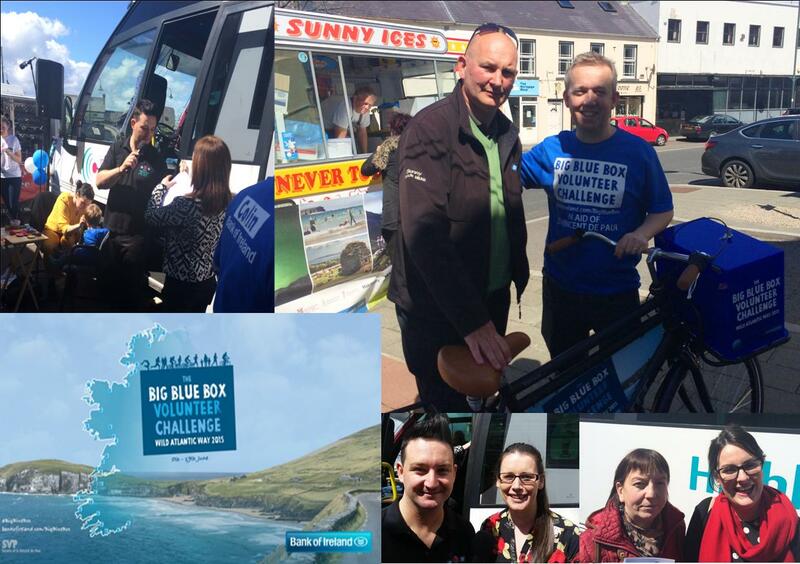 Fundraising events took place in every town along the route were the Big Blue Box travelled. All donations raised in each town went locally to the Saint Vincent de Paul. 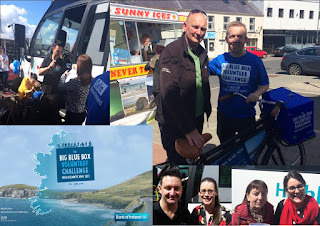 On Friday June 5th, the Bank of Ireland in Carndonagh received the Big Blue Box from Moville. A live outside broadcast was host by the Gary Gamble Show on Highland Radio outside the Bank of Ireland in Carndonagh in aid of Saint Vincent de Paul from 1pm through 3:30pm. A number of volunteers collected from the local community in aid of the Saint Vincent de Paul. The staff of the Bank of Ireland engaged with the local people inviting them to enter competitions and offering complimentary tea or coffee and ice cream for the children. The slight rain showers didn’t deter the community of Carndonagh as they all enjoyed the wonderful atmosphere. All monies raised on the day were then matched by the Bank of Ireland in Carndonagh and presented to the charity. As the route of the cycle was along the Wild Atlantic Way, Jimmy Stafford, Manager of the Bank of Ireland Carndonagh, invited the Interim Marketing manager of Inishowen Tourism, Siobhán Kelly to say a few words on tourism on the local area. Siobhán spoke on Highland Radio about Inishowen hosting one of the Wild Atlantic Way signature points, Ireland’s most northerly point, Malin Head and continued to tell of how we are welcoming a significant increase in visitors to the peninsula already this year. This is a great initiative created by Bank of Ireland bringing the neighbouring towns together along the Wild Atlantic Way and generating interest in the Wild Atlantic Way locally while supporting a brilliant local cause. Perhaps it will come to a town near you next year.